My feminist gender agenda has been rather challenged by the (inevitable…) ‘princess’ phase that Miss R caught on starting school. I fought it for a bit, then decided it was hopeless and unkind to keep on harking about how boring Princesses’ lives must be: “But what do they DO all day?”, I asked, but never really got very far in trying to convince anyone that being a Pink Princess shouldn’t be the sum total of female ambition when one is 5. So, instead, I decided to embrace my Inner Princess, went to the Red Cross charity shop down the street and found an old pink sheet. I grabbed my beloved sewing machine. 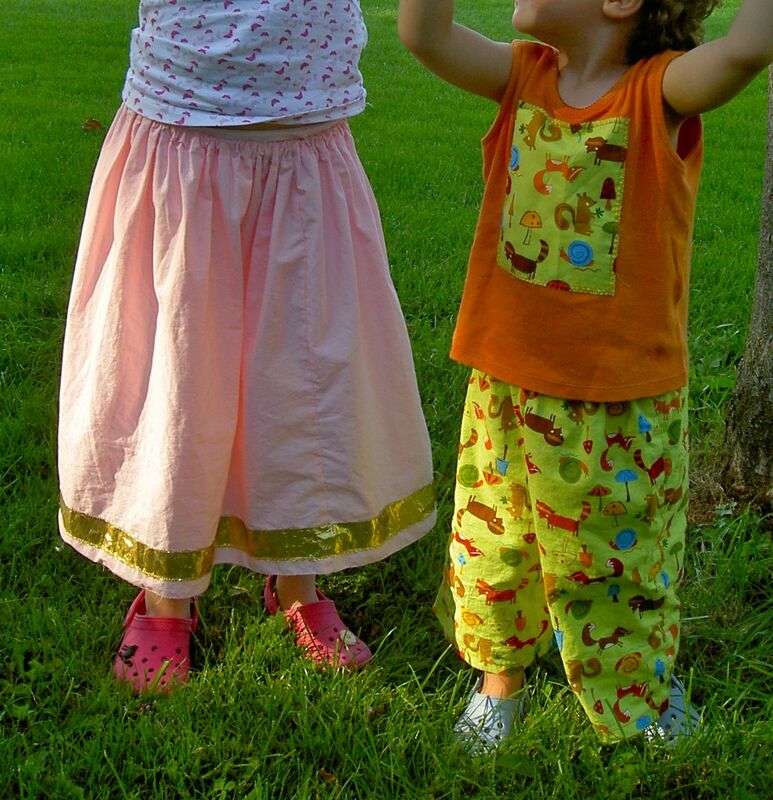 This is one version of the just-about-wearable-to-school pink skirt, and Mr A next to her wearing pixie shorts (an adapted Butterick pattern), and refashioned T-shirt. The orange T-shirt, belonging to Miss R originally, had puffy sleeves so I chopped these off and hemmed them. Elastic waists: the way to go for Small People to dress themselves!